Still catching up from Hackathon. I put together a couple of hour-long radio shows that were a lot of fun to build. The first one is an hour of 1970s and 1970s-adjacent jazz. Lots of fun stuff in this, including some electric Vince Guaraldi, tasty jazz organ, some modern finds (Yussef Kamaal for the win), and a little Digable Planets. Enjoy! We just finished another Veracode Hackathon, and this one was rock and roll themed. One of our brilliant hackers put together an Internet radio station where you could sign up for a one-hour time slot and post a playlist. Naturally, this was catnip. I spent a few hours putting together two playlists, which I’ve embedded below—one all genres and one focusing on (mostly) 21st century jazz. Production notes: I did some processing of individual audio files through Amadeus Pro and assembled everything in GarageBand. I’m very much still learning how to crawl with the latter tool, so I hope it doesn’t stink too much. The playlists are below. Enjoy! I struggled with this mix for quite a while, and probably have two other mixes of rejected tracks even though the final version clocks in at 2 CDs’ length. The hard bit is always mood. Summer is easy mixin’ weather; winter, especially this winter, was hard. And a lot of this mix struggled with the challenge of a world turned upside down. So there are a few more instrumental tracks, a few more down tracks. But it starts in a place of fragile hope, with Lou Reed’s incredibly timely song of transsexual identity which is equal measures crisis and birth of the new, and ends in a place of defiance. And maybe that’s what we have left to ourselves right now. This has been germinating for a while, and I had to drive to North Carolina and back to finish it. This was the mix of no rules, as you can tell by the length. Baby, I’m In the Mood for You – Bob Dylan (The Bootleg Series, Vol. 9: The Witmark Demos: 1962-1964) A demo of Dylan’s raunchiest, most rural love song? Sure, why not. Bring it On Down to My House – Warner Williams with Jay Summerour (Classic African American Songsters from Smithsonian Folkways) A raunchy blues song? Sure, why not. Jake Leg Rag – Narmour & Smith (Lead Kindly Light) A fiddle tune? Sure, why not. Where Shall I Go? – Sister Marie Knight (When the Moon Goes Down in the Valley of Time: African-American Gospel, 1939-51) A gospel tune that lifts off into the stratosphere? Sure, why not. Little Island Walking (Peel Session) – Jim O’Rourke (Peel Session) Jim O’Rourke doing a straight-on John Fahey pastiche? Sure, why not. We Would Be Building – Daniel Bachman (Orange Co. Serenade) Primitive guitar cover of a Methodist hymn? Sure, why not. On The Banks Of The Owichita – John Fahey (The Dance Of Death & Other Plantation Favorites) A primitive guitar evocation of the slow river? Sure, why not. I Wish I Knew How It Would Feel to Be Free – Nina Simone (Nina Revisited… A Tribute to Nina Simone) A landmark Nina Simone tune? Sure, why not. 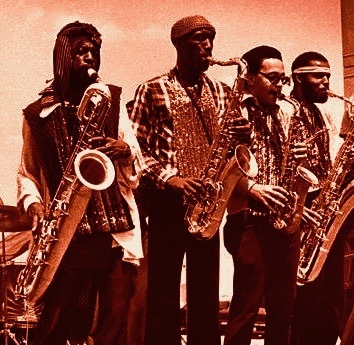 Peace And Love – Gary Bartz And NTU Troop (I’ve Known Rivers And Other Bodies). “We got a hand for the Bronx”? Sure, why not. The Raven Speaks – Gary Burton & Keith Jarrett (Gary Burton & Keith Jarrett) A funk number with Keith Jarrett on the Fender and Burton on vibes? Sure, why not. Brown-Baggin’ – 24-Carat Black (Ghetto: Misfortune’s Wealth) Straight ahead funk from a very strange concept album? Sure, why not. Disrobe – Medeski, Martin & Wood (The End of Violence) A groove I’ve been sitting on for a very long time? Sure, why not. Doing It to Death, Pt. 1 (Single) – The J.B.’s & Fred Wesley (Pass the Peas: The Best of the J.B.’s). “In order to get down, I got to get in D”? Sure, why not. You Can’t Blame Me – Johnson, Hawkins, Tatum, & Durr (Eccentric Soul: The Capsoul Label) The world’s weirdest soul hook? Sure, why not. Everybody Loves the Sunshine – Roy Ayers Ubiquity (The Best of Roy Ayers (The Best of Roy Ayers: Love Fantasy)) A blissed out fusion number? Sure, why not. Blue Lines – Massive Attack (Blue Lines) A genre-creating Tricky rap? Sure, why not. The Sad Punk – Pixies (Trompe Le Monde) Changing gears abruptly? Sure, why not. Marrow (Live) – David Byrne & St. Vincent (Brass Tactics EP) St. Vincent backed by a freaking great horn section? Sure, why not. What We Loved Was Not Enough – Thee Silver Mt. Zion Memorial Orchestra (F*ck Off Get Free We Pour Light On Everything) Heartrending Canadians? Sure, why not. Roked – Shye Ben Tzur, Jonny Greenwood & The Rajasthan Express (Junun) Israeli composer, Indian musicians, Radiohead guitarist? Sure, why not. %%%%%%%%%% $$$$$$$$$ >>>>>>>> >> >> >> @@@@@@@ – The User (Symphony #2 For Dot Matrix Printers) Dot matrix printer music? Sure, why not. Do the Dog – The Specials (The Specials) Do the dog, not the donkey? Sure, why not. You Satellite – Wilco (Star Wars) Wilco does late period Sonic Youth? Sure, why not. Nothing Clings Like Ivy – Elvis Costello & The Imposters (The Delivery Man) Plaintive country rock from a London kid? Sure, why not. Just One Thing – My Morning Jacket (It Still Moves) Unabashed Southern rock? Sure, why not. Shake It Off – Ryan Adams (1989) A dark rewrite of an infectious Taylor Swift original? Sure, why not. One Sunday Morning (Song For Jane Smiley’s Boyfriend) – Wilco (The Whole Love) Eleven minutes of a murder mystery wrapped up in an NPR-friendly arrangement? Sure, why not. Moonshine Blues [live 1962 10 at Gaslight Café, New York City] – Bob Dylan (The Gaslight Tapes [live 1962 10 at Gaslight Café, New York City]) A stark folk original and probably the most harrowing version ever recorded? Sure, why not. Bladesteel – Daniel Lanois (Here Is What Is) Four minutes of slide guitar with New Orleans drums by Lanois? Sure why not. Amy – Ryan Adams (Heartbreaker) A track that opens with Adams’ most annoying verse melody, but transitions into his most heartbreaking chorus melody? Sure why not. Stanwell Perpetual – David Grubbs (The Spectrum Between) Three minutes of unresolved tension building with the horn section from Camoufleur? Sure, why not. The Things I Say – Joanna Newsom (Divers) A straight folk track that resolves to an ascending backtracked vocal cliffhanger conclusion? Sure, why not. Untitled – R.E.M. (Green) Michael Stipe’s paean to his parents? Sure, why not. Sun Is Shining – The Fireman (Electric Arguments) Electronica by Paul McCartney and Youth? Sure, why not. It’s another new year, another mix. As always, this is no more or less than what happened to be kicking around my iTunes for a long period of time, so I make no claim for it hanging together. Except I’m kinda happy about the string of tracks from #2 through #13 and parts of the last stretch. “Papa’s Got a Brand New Bag”: Yes, yes he does. You can’t have this track, with James Brown yelling out “This is a hit!”, in a playlist and not have it leading off. “Autumn Sweater”: Here the groove is all drums and bass, especially bass. Love what James McNew does with the bassline during the break here. “Electricity”: A break from the groove for a guitar based rocker. I had forgotten this album until Shuffle brought it back to me. A great track. “Masanga”: An obscurity, this popped up on a compilation of sub-Saharan guitar that I found on Bandcamp over a year ago. I love the purely guitar driven groove. Seriously propulsive and fun. “I Love This Life”: Also propulsive and fun, but almost all synths, I slept on this track from The Blue Nile for a long time. I’m not sure what “ragtown” meant to Paul Buchanan, but when I listen to this track I feel like I understand. “The Statue Got Me High”: A non-sequitur but a fun one, and a great singalong. “Mod Lang”: Gee, there’s a “groove” theme going on on this mix, which is unusual for me. I love how Chilton takes a handful of lyrics that are almost nonsense and weaves them into urgency. “Courage”: A PG rarity that was released alongside the 25th anniversary reissue of So a few years back. Too lyrically heavy and overtly structured a song to fit comfortably on that album, I don’t know if it works well here either but I couldn’t cut it. “Rain”: Groove, man. Complete with the backward bit at the end. “JC”: Shift of tone to a minor key with a fair amount of distortion. “After the Flood”: This track is the still heart of this mix. I stumbled across Talk Talk by accident, more or less, thought they had been on my list of bands to find for a long time thanks to the late lamented Lists of Bests. This is an incredible track, building from almost inaudibility up through some killer organ work into a long burn of a distortion guitar solo. I have listened to this one for days at a time. “Try Not to Breathe”: Taking a breath, this is a song I didn’t think so much of until I was recovering from surgery a year ago. Then it made a lot of sense. “No Love Lost”: The rare Joy Division song I like more as an instrumental, but there’s still something compelling in Ian Curtis’s delivery here. “Lick the Palm of the Burning Handshake”: Boy, Nika can really do apocalyptic, can’t she? Even if we don’t totally understand what she’s singing about. “Svatba”: The transition from Nika’s wordless outro to “Lick the Palm” into the Bulgarian voices here was a happy shuffle accident. “Accordion”: Another happy accident, another supremely bizarre rap from MF Doom. “Super Mario”: Well, as long as we’re doing bizarre, I figure an a cappella version of an 8 bit videogame theme qualifies. “Gallows Pole”: If there’s a theme wending through the back half of this, it might be covers vs. authenticity. The ballad, which started out as “The Maid Freed from the Gallows” in the Child ballads before being recorded as “The Gallis Pole” by Lead Belly, is colored by Plant’s rock god delivery until it’s hard to tell at the end who is swinging from the gallows pole, and whether the pole is literal or metaphoric. A neat trick. “Tall Trees in Georgia”: Again, covers and authenticity. When Eva Cassidy was alive, she was lauded as a vocalist but not so much as an authentic jazz talent (I remember one review saying “She even covers Buffy Ste Marie!”). It’s a moving performance nonetheless. “They Won’t Let Me Run”: A beautiful groove for an ugly story. “Holocene”: Was totally obsessed with this song for about 18 months. “Let It Down”: Tension release necessary after the last few tracks. “Rill Rill”: Speaking of authenticity, how about copping “Can You Get to That?” for this song about teenage girl angst? Well, yeah, and it works, so the hell with authenticity. “The Times They Are A Changin’”: I was disappointed with the rest of this album only because it doesn’t live up to its title the way this lead off track does. “Times” is truly one of Dylan’s most gospel-like songs to begin with, and this version pulls out all the revival stops. A fantastic cover. Starting to have the energy again to think about posting here, which is nice. I’ve been down the grindstone for a very very long time, and now, faced with some unexpected downtime, I’m going to use the opportunity to catch up on a few things. Starting with this. I completed something other than regret, my 33rd mix in the modern era, on the 10th of November, and it’s all over the map, but with some pretty strong thematic material running through as well. I especially love the way that Laura Marling excavates on the three tracks from Once I Was an Eagle, which is my favorite album of 2013; the woozy, witchy, R&B-driven silliness of “Nommo (The Magick Song)” (“All praises due to the Black man,” indeed); the light touch of Antony’s “Crackagen”, and the way that John Fahey’s riff on Clarence Ashley’s “The Coo Coo Bird” fits so seamlessly with gospel. I’ve definitely got something other than regret. As I grow … well, older isn’t right, and neither is more mature, so let’s just go with “as I grow,” I find that what I listen to is less about lyrics and singing along and more about just listening. So, of the 19 tracks on this mix, six have no words at all, and a few more are mostly nonsense. No real notes here, except to note that Jonny Greenwood’s Bodysong, from 2003, is an unlikely sleeper album. There are bits that remind me of Ravel, and Berg, and glitchy techno, and sometimes they come in the same song. Also: why did it take me so long to listen to Bruce Cockburn? He would have been right up my alley in 1988 or 1989. Also also: I’m in the crowd for that 2004 Sonic Youth performance at the Showbox. This one. I wasn’t expecting to do another mix so soon after the last one (the business), but this one was kicking around for a while. As always, I was throwing songs I liked to listen to into a temporary playlist called “next,” but couldn’t figure out how to link them all together. Then one day I heard a recording of Kenyan girls singing (like so much these days, it surfaced out of my library on shuffle), and I said “Hmm.” I threw a handful of short world music songs into the mix (from an album of Tuvan throat singing, an Internet-curated collection of African music, and a historic field recording of the Bera pygmies from the 1950s), shuffled them about until I got the right order, and before long I had something that seemed set to shuffle into the ear in the same way that the songs had wormed their way into my mind. An attic space overgrown (also on Art of the Mix) was the result. I finally heard the original version of “Strange” (on Wire’s Pink Flag) last year, and while I love it, it made me appreciate the R.E.M. version I heard in high school–bravura, loud, beery, and outré. Zola Jesus was a discovery for me about this time last year. “Vessel” is the strangest arrangement of the album, with Nika Roza Danilova’s voice hocketing into the echoing void at the opening over a sort of middle-period Dead Can Dance accompaniment. And that’s just the opening. “Right On”: Who knew that Joanna Newsom made such a good chorus for hip-hop? Christian Scott’s “The Eraser,” its strikingly original jazz arrangement of Thom Yorke’s original, has been in heavy repeat since I heard the album last year. The whole album is worth checking out. “Harrowdown Hill” gives you an opportunity to hear Yorke’s original glitchy percussion against the jazz acoustic original. Not as starkly tense as some of Radiohead’s earlier (or later) works, it feels a little more personal but still despairing. Sonic Youth’s final(?) recording, a soundtrack, carries enormous tension throughout it even if you don’t understand the cinematic context of the songs, which, um, I don’t. Still absorbing. I dug out “Automatic” the other day–still a great album all these years later. I found Sleigh Bells thanks to Molly Young‘s plug for the band (she plays the gum-chewing cheerleader in the video for this song). I like the second album better as an album but “Infinity Guitars” is still an astonishing kick to the head. Someday Radiohead will make a full album that “Staircase” fits into and I’ll be a happy man. My Morning Jacket’s It Still Moves was the last of the early albums and the one I love best, I think. This one reminds me of growing up in the South. Robert Plant’s cover of “Silver Rider,” from the underappreciated Low album The Great Destroyer, is both hypnotic and wholly respectful of the original. Low’s most recent album is the one I’ve liked best since The Great Destroyer. “You See Everything” is a great spotlight for Mimi Sparhawk’s voice. Finally we get to “Moorestown.” After the psychedelic wonderland of Ghosts of the Great Highway, it took a long time for Sun Kil Moon’s acoustic albums to grow on me. But this one had been waiting to find me, and today I realized it was the closer. Finally, a note on mixes: Seems to me that I put them together to digest the music I’m listening to and to claim it before it claims me. Did you ever notice how many songs there are about the music business itself? I think the popular music industry is possibly even more self-referential than the newspaper industry (though not nearly as self-referential as the Internet…). I started hearing the connection a few years ago and began collecting examples in a playlist, and I finally have enough to share with you in this mix (see also Art of the Mix). Of special note is the hip-hop section (coming just after Joe Pernice’s wry anti-anthem decrying touring, “We Love the Stage”), featuring “Check the Rhime,” origin of “Music industry rule #4080/record company people are shady,” followed by Steinski’s record industry slag off mix of “Hit the Disco,” wrapping up with J-Live’s epochal “Them That’s Not,” which features the most astonishing bit of tempo bending that I’m aware of.